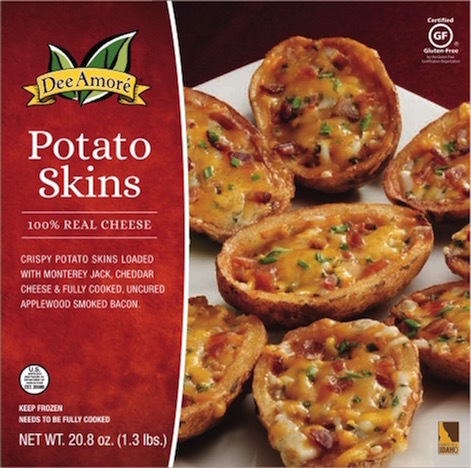 Our 100% real cheese potato skins are loaded with flavor and restaurant-quality goodness. Stuffed with Monterey Jack & cheddar cheese and fully cooked, smoked bacon, our crispy potato skins are both mouth watering and satisfying. Always a hit, our savory skins make a great snack or appetizer for your family--and they're the perfect addition to any party or game day event. And they're gluten free! Available in retail (20.8 oz.) and club (38 oz.) sizes. Fried Potato Skins (potatoes, canola and/or soybean oil), Cheddar Cheese (pasteurized cultured whole milk, salt, enzymes, annatto color), Monterey Jack Cheese (pasteurized cultured whole milk, salt, enzymes), Fully Cooked Uncured Bacon (pork bellies, water, sodium lactate (non-dairy), salt, turbinado sugar, spice extractives (cinnamon, clove, capsicum), celery powder), Salt, Chives, Onion Powder, Garlic Powder, White Pepper.